Whether the goals are for the hunter ring or western pleasure, Elevation Equitation offers individualized lessons taught by a certified instructor to help both youth and adults achieve with their horses. 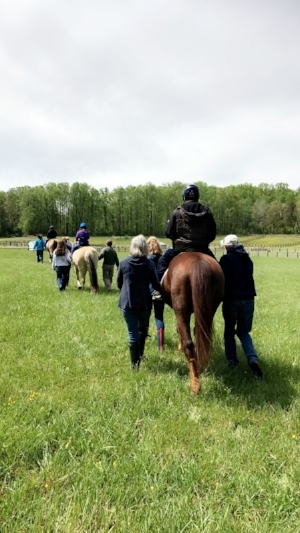 Safely teaching a broad portfolio of riders with diverse emotional/physical/cognitive challenges, the lessons taught by a certified therapeutic riding instructor promote independence and strive towards holistic goals. Expert mentoring is also available for those wishing to pursue instructor certification. Through evidence-based equitation science, Elevation Equitation will work to train horses on the ground and under saddle. Utilizing equine welfare-enhancing strategies, Elevation Equation may advise on farm and herd management to promote equine health and wellbeing. A certified equine specialist may collaborate in equine-assisted therapy and learning sessions to provide horse-behavior expertise and support mounted work.